Jetpak Eco Lodge i Berlin, Tyskland : Boka nu! Attention jetpak eco lodge is inside the grunewald forrest!!! pls READ the description 'before booking'. 20 minutes from Zoo Station nestled 1 block into the forest, JetPak offers bright clean rooms and truly spotless bathrooms. The large common room provides space for free 24 hour high speed internet, nightly big-screen movies, foosball or downtime on one of the many sofas. Cold beverages, free coffee and tea, a $3,50 breakfast buffet, and free linen are among the many amenities on offer. JetPak also provides table tennis, basketball, volleyball and soccer in their huge outdoor recreation area. Jetpak is an eco-friendly hostel. 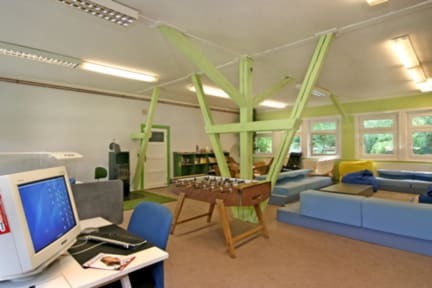 The hostel's power comes from 100% renewable sources; it is heated by a modern, wood-burning, CO2-neutral heating system; and the hostel's hot water is heated by solar panels. Waste is divided, with bottles returned to the manufacturer for re-use, food composted on-site (at a safe distance from the hostel! ), and many other items are recycled. Though bus service runs 24 hours, the hostel also rents brand new german bikes for the most convenient access to the city center. Three major museums are within walking distance as well as an extensive trail system through the pristine Grunewald Forest. 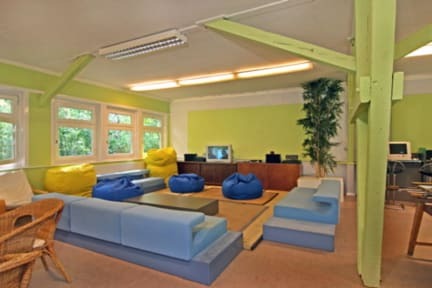 Come enjoy the award-winning staff, comfort and scenery at this premium Berlin Hostel. Peaceful and a great place to meet new people while travelling! It was a perfect vacation hostel for me.